School holidays are here, which means so too are long days of keeping the kids entertained. If you don’t already have a getaway planned, consider taking the short drive out of Sydney to Port Stephens – it’s only two and a half hours, and is well worth the drive. Here you’ll find a plethora of family friendly activities to keep both you and the kids entertained. But first off, you’ll need somewhere to stay. Shoal Bay Country Club couldn’t be better suited. 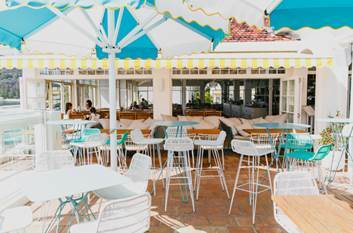 The Country Club has recently undergone a huge $6 million revamp, so the iconic venue is a gorgeous place to spend a few days, as well as having a wealth of kids activities available every Sunday from 12-2pm. for the upcoming winter school holidays: think kids concerts, magic shows, kids trivia, games and crafts days, and kids karaoke, and a range of fun activities every Sunday from 12-2pm. SBCC’s restaurants also make sure to provide child options on their menus, so those of us who suffer the curse of a family of picky eaters can rest easy. Once you’re there, Port Stephens is an amazing place to explore. SBCC is beachfront, but the choices are endless. There are plenty of kid-friendly beaches in the area, including the aptly named Little Beach, which is great for young kids and has a wharf and playground nearby. 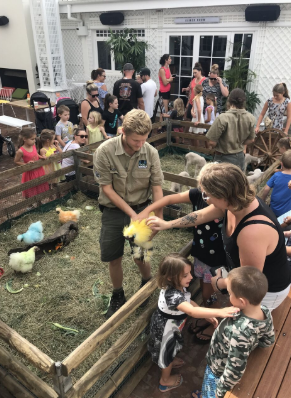 But if the kids need more stimulation than a wintery beach, look to Oakvale Wildlife Park, which is home to native, domestic farm and exotic animals: koalas, kangaroos, Tasmanian devils, alligators, and ring-tailed lemurs are amongst the many that live there. The animals roam freely around the park and interaction is encouraged, so kids love it. It’s also home to a water activity area if the winter chill isn’t too much! If you’re after a more natural experience of the local flora and fauna, try Tiligerry Habitat, where 9 hectares of wildlife reserve await you. As well as guided walks and talks, the volunteers at the reserve run a BBQ every second Sunday of the month – a great way to meet like-minded people (and get some socialisation in for the kids!). It’s also worth remembering it’s the perfect time to go whale watching, which is a spectacle kids are always enthralled by, and something they’ll remember for years to come. From May to early September, you’ll be able to see literally hundreds of them from various vantage points – local favourites include from the Tomaree National Park and Fingal Bay. You can also get up close and personal with a whale watching tour, which depart several times a day. ← STAY FRESH THIS WINTER!